The all-new Audi A4 was unveiled at the beginning of this year, leading the way to a whole range of models, like the Audi A4 allroad or the new Audi A5, which will be offered for sale towards the end of the year. Rumors also stated that the German company would also release a chopped roof of the Audi A5, the model reportedly hitting the market at the end of next year. 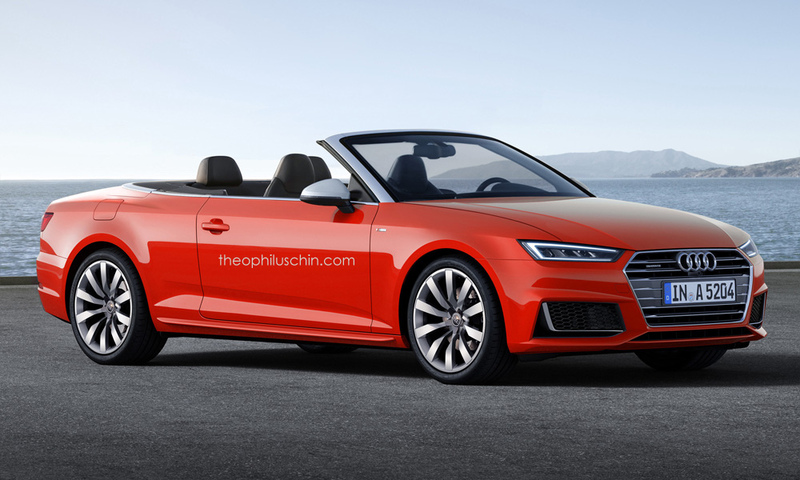 Until then, rendering artist Theophilus Chin has come up with its own interpretation of an Audi A5 Cabrio. The rendering seen above is highlighting the A5 with a chopped roof, along with some slight body features, which makes it more aggressive. In case it will come, the all-new Audi A5 Cabrio will share the same cutting-edge technology as the upcoming Audi A4 or A5, with high-tech gadgets inside, autonomous driving function, telematics and assistance system, and a few more. And just like the all-new Audi A5 which will debut at the end of the year, the A5 Convertible might also share the same engine lineup, like the 2.0-liter turbo four-cylinder with 211 horsepower, or the higher 3.0-liter supercharged V6 unit, with 333 horsepower.